What if you could help Paws For Learning win $1,000 just by giving 10 bucks? Or maybe even the $10,000 Golden Ticket? Thursday, November 16 is Give to the Max Day. Your donation can make a huge difference in the educational life of a struggling student. Dog teams make a difference! 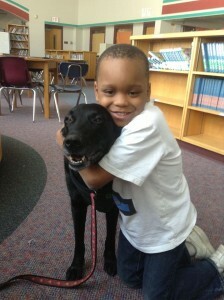 Our educational assistance dog teams make a difference in a child’s life. Schools report increased cooperation, compassion and communication between students. Paws For Learning provides a unique learning environment between adult volunteers, dogs and high-risk students in the Public School system. We can see the difference our weekly visits make in the students that we work with, but we need your help to expand our program and reach more kids! Each month, we have more schools requesting our dog teams to work with their students to improve math, reading and social-emotional skills, but we need to train more volunteers and their dogs to grow. Your support will help us make a difference in the lives of at-risk students in the Twin Cities. Plus, you could help us win a Golden Ticket! Each hour, $1,000 will be given to a random donor’s charity during Give To The Max Day. You could be that donor! Minimum donation is just $10 – imagine the thrill of your $10 turning into $1,000 or possibly even $10,000! Help us spread the word by sharing our page with your friends on Facebook. Please “like” us on Facebook and help us spread the word. You can find out what we’re up to at facebook.com/pawsforlearning – we’ve got photos and updates from our dogs as they visit the school. Check out what our dog teams are doing and share your thoughts and encouragement with us. We may even pull an all-nighter on November 17 to encourage people to give during the wee hours when we have the best chance of getting a Golden Ticket. If you’re a night-owl, check in on us and see how we’re doing and share a virtual coffee with us as we try to encourage our friends and fans to toss us a few bones during GiveMN. As you consider your charitable end-of-year giving, please consider participating in Give to the Max Day November 16. 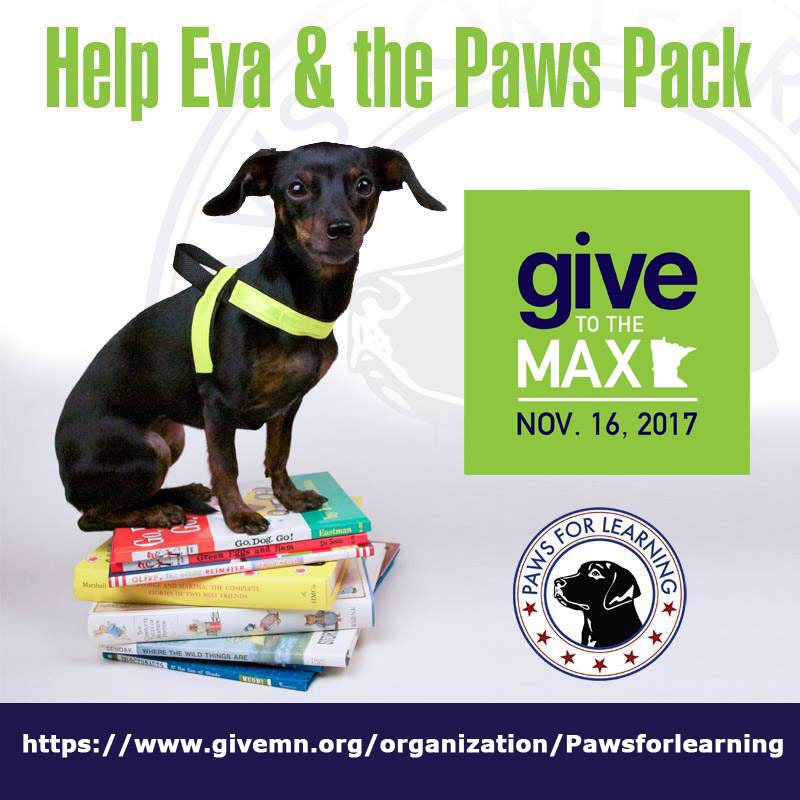 GiveMN is easy to use, and your gift to Paws For Learning will make a huge difference to our ongoing work.